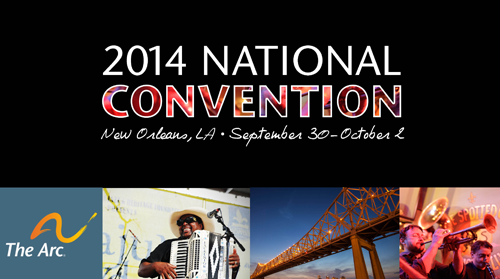 New Orleans, LA – Next week, The Arc’s National Convention will kick off in New Orleans, Louisiana with more than 800 disability advocates, professionals, and people with intellectual and developmental disabilities (I/DD) coming together to learn, forge connections, and energize the disability movement. This year’s theme focuses on three key goals– To Network, To Improve, and To Lead, three simple ideas that embody what The Arc stands for. This year’s event will have a strong focus on criminal justice issues and the I/DD population. “The Arc’s convention is a once a year chance to bring our network of nearly 700 chapters, their members and professionals, and people with disabilities together for a unique experience. This year, in addition to our usual activities, we are turning a national spotlight to criminal justice and disability. The Arc has a long history of standing up for the rights of people with disabilities who find themselves involved in our legal system as victims, suspects, or offenders. “We are thrilled to be honoring James Ellis, one of the leading lawyers in the disability community. Additionally, we are excited to have two award winning documentary film makers who will be exposing the difficulties facing children with intellectual disabilities involved in our criminal justice system,” said Peter Berns, CEO of The Arc. an exciting event hosted by The Arc of Louisiana and The Arc Baton Rouge, which includes a second line parade down the Chartres Street to the Presbytere, and a scheduled guest appearance by Lt. Governor Jay Dardenne. “We are excited to serve as the local host committee for The Arc’s national convention. With so many changes at the federal and state level including managed care, the CMS home and community based setting rule, and wage and hour issues; I think the timing of this event in New Orleans is ideal. My hope is with hundreds of advocates and the leading experts in the disability community in our backyard, we will push forward with the necessary conversations to continue to move our state in the right direction,” said Kelly Serrett, Executive Director of The Arc Louisiana. “The Arc’s national convention is the premier event for disability advocates in our network, and we are thrilled to have everyone in New Orleans this year. Our program covers a number of key issues facing communities in Louisiana as well as nationally, from public policy to early intervention services for families with a loved one who has a disability. We are so pleased with the line-up of speakers that will be joining us, and look forward to showing our colleagues from across the country what our great state and the city of New Orleans has to offer,” said Barry Meyer, Executive Director of The Arc Baton Rouge. This entry was posted in Press Releases and tagged Convention 2014. Bookmark the permalink.